The Sword of Rome is GMT’s card driven game on the early years of the city-state of Rome during its struggle to survive as an entity on the Italian peninsula. Given the strategic situation Rome faced, it is amazing they were able to survive and expand. How different would history have been if this small city had been vanquished by her many neighboring enemies? As the Roman player in The Sword of Rome, you will be faced with the same dilemma. Let’s first look at Rome’s strategic situation. It is surrounded on three sides by enemies. To the north are the Etruscans, to the east are the Samnites and to the south are the Greeks. Adjacent to Rome are the well led and fierce Voscii tribe. If Rome must fight simultaneously on all these fronts, she will inevitably lose as the Romans do not have the manpower to fend off all these attackers. Also, all of their victory point cities are adjacent to enemy areas. Capua is cutoff to some degree by the Voscii and the Samnites making defense of this city problematical. Losing it early will result in a deficit in victory points that will accumulate turn after turn. Its loss also means 1 less reinforcement each turn which can be critical since Rome will be constantly fighting for its survival. Other cities are also vulnerable. 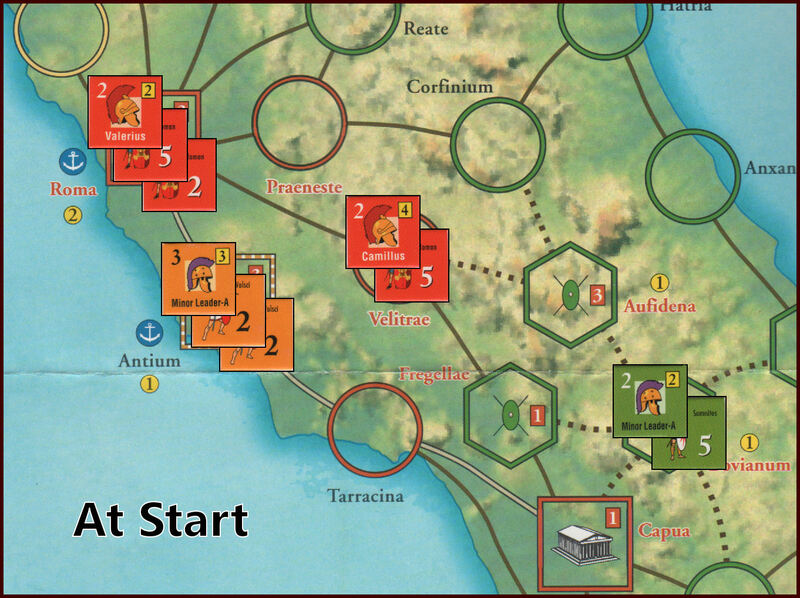 Sutrium and Narnia are exposed to first turn attack from the Etruscans. They only start with a loyalty level of 1 making them easily conquered by siege. The other Roman Victory Point spaces are Praeneste and Velitrae, both adjacent to Samnite territory though less easily threatened by Samnite forces early on. Therefore, the Roman strategy must be to prioritize the threats and act decisively against each in turn. Let us first examine the threat from the Voscii. They start adjacent to Rome and actually block Roman movement to its southernmost city, Capua. They are well led as their leader’s Tactical rating is 3. In Antium, they have a strong walled city difficult to besiege successfully. Fortunately, they start out with only 4 CU’s. Usually, other players will quickly utilize their Neutral Player Activates cards to reinforce the Voscii early in the first turn. Even 1 or 2 additional CU’s for them makes them a formidable force. Rome can gain several advantages by taking out the Voscii early. If they defeat the Voscii in battle, they can use the Support Points gained by the victory to add loyalty to Sutrium, Narnia or Capua, making these cities more difficult to besiege. Second it opens a more secure path to Capua so its defense becomes somewhat easier. Third, destruction of the Voscii removes one enemy permanently from the game. Fourth, taking Antium gives you an additional reinforcement each turn which will be sorely needed. To tackle the Voscii you must use Camillus, your best general with 10 Roman CU’s some of which must be picked up as you move through Roma. The ensuing combat will give you + 4 for the Force Ratio Modifier (+3 if the Voscii have been activated and reinforced), +1 for the better Leadership. If you have any combat cards with positive modifiers, now is the time to use them. The Voscii will have a +1 for combat in a friendly space. This results in a 79% chance of victory in battle (72% if the Voscii have been reinforced with a strength point from play of a Neutral Player Activates card). With a little luck, the Voscii will be completely destroyed and you can spend the next few card plays besieging Antium. If the Voscii retreat into the city rather then risk a battle in the open plains before their city, they must leave 1 CU outside which will result in an Automatic Victory and you can still begin the siege. If they have been reinforced, they will have 2 CU’s outside the walls giving you an almost assured victory and 1 Support point. If they are not totally destroyed, the survivors must retreat into the city to sit out the siege. It is easy in the first turn to get distracted from this strategy as the Etruscans may be besieging one of your cities (more on this later) or the Samnites or Greeks may be besieging Capua. You may react to this with Camillus by leaving a Minor Leader with enough CU’s to prosecute the siege and keep any surviving Voscii bottled up. However it is important to end this siege by the end of the first turn as you will probably need the extra CU reinforcement for the 2nd turn and you will have plenty of other things to keep you busy on turn 2. The Voscii first strategy works best if you can make an alliance with the Etruscan/Samnite Player on turn 1. Now why should the sworn enemies of Rome do this? It may actually be to their advantage! They will almost certainly be attacked by the Gauls in the north on turn 1. They are threatened by Rome in the south with Tarquinii being very vulnerable. Loss of this city will cost them a victory point and 1 reinforcement. An alliance with Rome on the first turn assures the safety of Tarquinii and allows them to bring the army in Clusium up north to aid the army in Pisae. If they can take out a lot of Gaul CU’s on the first turn and then harass the Gauls with the Transalpine Gauls thereafter, the Etruscans will be in much better shape to face off against Rome on turn 2 or 3. The Samnites meanwhile can go for Neapolis or Tarentum (although it’s more difficult to besiege Neapolis) since an alliance with Rome prohibits an attack or siege of Capua. The other reason for an alliance with Rome on turn 1 is to prevent Rome and the Gauls from allying. Even if the Gauls have victory point cards for actions against Rome, it is much easier and safer to raid Etruscan territory on turn 1. 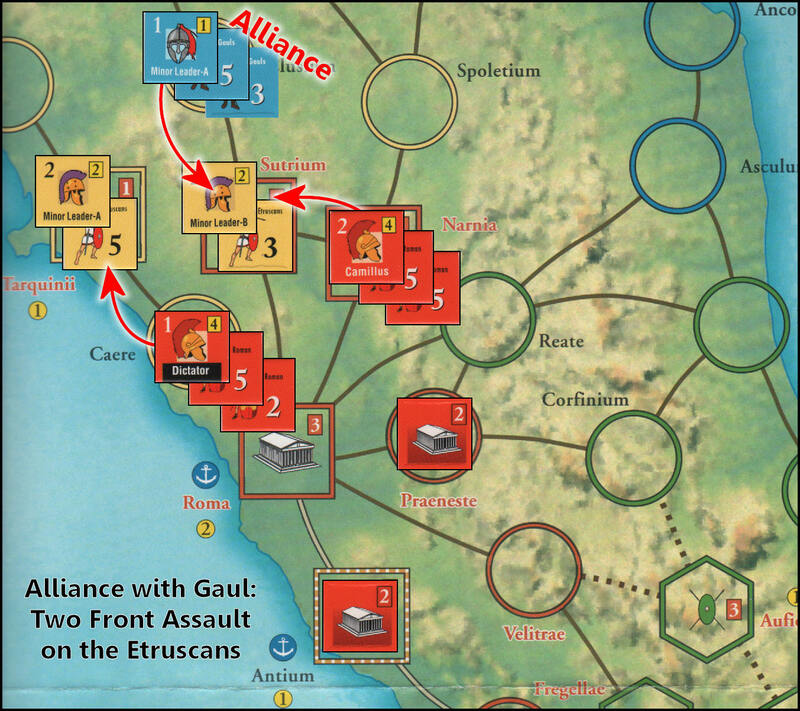 A Gaul – Roman alliance is a nightmare for the Etruscans as they will now be fighting a 2 front war. Rome’s special ability to plant Colonies is critical in the first two turns of the game. Ideally, the Roman player should form one colony on turn one and two colonies on turn two. These walled cities provide two crucial advantages that multiply over the course of the game. First and foremost they provide crucial protection to your victory point spaces since they will now have to be besieged to be captured by the enemy. Colonies at Praeneste and Velitrae defended by a few Roman combat units help protect Rome from direct attack by the Samnites. More importantly, a defended colony at Tarracina with a high Loyalty rating preserves your line of communications to Capua and can serve as a jumping off point for a late game attack on that Greek city of Neapolis. Second, each walled city for the Roman player provides one combat unit per Reinforcement Phase. In essence, they pay for themselves one turn later and provide crucial manpower each turn thereafter at a time when Rome’s enemies are also becoming more powerful. In this game, losing a battle can make an Army impotent due to the lack of combat units. This often results in loss of momentum and can drastically shift the strategic balance of power on the Italian peninsula. Therefore, the extra combat units generated each turn by these colonies represent a commodity of enormous importance. Therefore, woe to the Roman player who ignores his ability to plant colonies as he will often be forced to fend off attacks from multiple directions with armies containing insufficient combat units. He will also be passing up easily attainable victory points. It’s Time to Absorb the Etruscan Culture! If Rome has been successful in conquering the Voscii, capturing Antium and planting a few colonies, he must now turn his attention to the Etruscans. Why the Etruscans? Quite simply, they are the more easily vanquished of Rome’s remaining rivals. Also there is the possibility of capturing Pisae and Tarquinii, two walled cities that will provide victory points for the Romans and badly needed Roman CU reinforcements each turn. At this time, an alliance with the Gallic player is most helpful. This creates a two front war for the Etruscans which may mitigate their special Bribery ability. Tarquinii is most vulnerable to a Roman assault since it is only two spaces away from Roma and should be the first objective. The Roman player can then march up the coast to siege Pisae. The Etruscan player is likely to respond with attacks from Samnite territory and the Romans will have to go on the defensive here basing their defense on Roma, Antium, and, ideally, walled cities previously placed in Praeneste and Velitrae. If feasible, they should try to add Loyalty Points for Capua as a bulwark against the Samnites. Once the Etruscans are conquered, Rome will be in a position to go on the defensive in the north and sit back while they accumulate victory points and build up massive armies. Additionally, they will be able to take the best of the Etruscan culture and pass it off as their own for future generations. If the Roman dilemma has been solved by implementing the strategies discussed above, the Roman player should be reaching the middle or late game gathering victory points and combat unit reinforcements from 10 victory point cities. This alone should be enough to give the Roman player victory. However, if the situation requires further conquests, he now faces a choice of two very tough opponents. The campaign against the Greeks is fraught with difficulty. The Greeks armies are usually superbly led by mercenary generals. Opportunities to gain victory points from conquered walled cities lie far to the south (except for Neapolis which is adjacent to Capua but usually strongly held by Greek armies). Additionally, Rome would be under pressure in the north from the Gauls and in the east from the Samnites. The Samnites are more easily accessible with three victory point spaces adjacent to Roman spaces. Attacking these Tribal spaces particularly when well-defended by Samnite combat units is an arduous proposition, yet probably preferable to a campaign against the distant Greeks. It will require good leadership and strong armies. Both of these should be readily available by this point in the game. 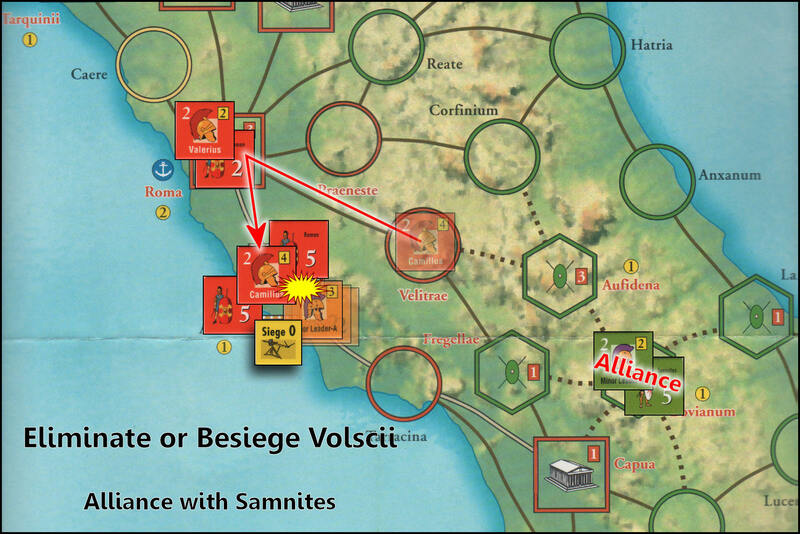 Therefore, an attack against Fregellae is called for, as its capture provides victory points and will decrease Samnite reinforcements in following game turns. This campaign is likely to be very attritional but, in balance, this favors the Roman player because of his greater number of reinforcements each turn. And what of the Greeks? At this point in the game they have likely conquered Carthage and will be threatening northward expansion. The Roman player must use hit and run tactics possibly combined with some naval landings to keep the Greeks off-balance while prosecuting any campaign against the Samnites. This will be a race against time as to whether the Roman player can complete his conquest of the Samnites before feeling pressure from the Greek armies. Hopefully, if play has unfolded according to the above strategies, the Roman player will have accumulated enough victory points to win the game before the Greeks arrive in force. “Dilemma” was originally a technical term in rhetoric, denoting a form of argument in which one’s opponent is faced with a choice of two unfavorable alternatives. In the Sword of Rome, the Latins are faced with multiple unfavorable options against numerous enemies in extremely close proximity. How the Roman player solves this dilemma will lead him to an astounding victory or relegate him to a footnote in history (much as the Etruscan civilization found out). In this game, it will take clever diplomacy and hard fighting to solve this quandary. I doubt rhetoric will be enough. Posted in Sword of Rome. Bookmark the permalink.